Restore your High Frequency Audio! GTK-150: Our gauge tweeters are a snap to install, literally. Between the models of bikes that don’t come with four gauges, along with the common desire to add more sound, it was about time we offered a solution. Each kit comes complete with our performance tweeters, crossovers, and necessary instructions. Other then the small amount of time for installation, nothing else is required. Kit Includes: 2 Tweeter Modules, 2 Crossovers Modules, 1 Installation Hardware Kit. 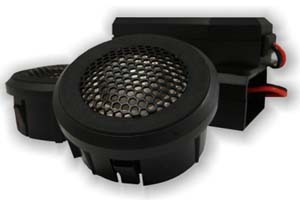 Specs: 12 db/octave Crossover, 50 Watts RMS, 100 Watts Peak (Rated - 50 Watts), Sensitivity, SPL: 93dB +/-2dB / 1W @ 1M, Magnet, 28mm x 8.5mm NEO. HG-0100M: Our new standard tweeter kits are exactly what your bikes audio system and your ears have been asking for. Each tweeter kit consists of two modules that fit in the two small recesses of your inner fairing under your windshield and follows the Batwing fairings natural lines perfectly. 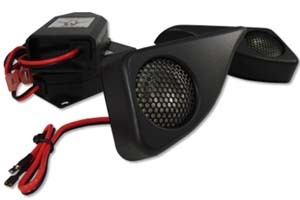 Rated at 50 watts RMS per tweeter, each module includes crossovers and a plug and play harnesses that makes installation a snap. Available in matte to match the stock fairing. Fits '96 to current. Matte finish. 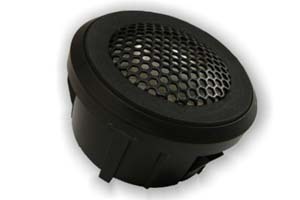 Specs: 12 db/octave Crossover, 50 Watts RMS, 100 Watts Peak (Rated - 50 Watts), Sensitivity, SPL: 93dB +/-2dB / 1W @ 1M, Magnet, 28mm x 8.5mm NEO. HG-0100B: Same as above but in gloss black finish. 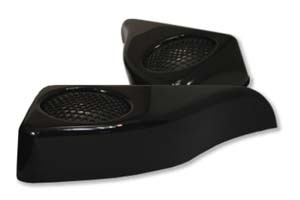 881: Add extra sound to your bike while accentuating your fairing at the same time! Kicker’s 1” KS25 Titanium tweeters are wrapped in sparkling chrome gives your speaker system an added Kick! 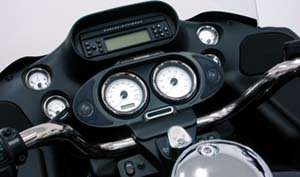 The tweeters are angled to aim the sound directly at the rider, no sound is blocked by handlebars. 882: Same as above but in black. 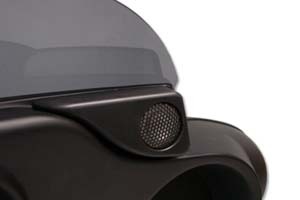 HT-0172: Fairing Tweeter Pod. 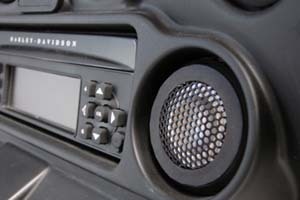 This NEW Speaker System helps restore all The lost Music being Trapped Behind the Stock Speaker Grill. Unlike Bass, High Frequency Has a Very Hard Time Playing Around Objects in Front of it like... Handle Bars, Master Cylinders, GPS units or What Ever. Re-Experience Your Music For The First Time. Fits MY '98 to current FLH/X Models. HT-0200: For '98 to current Road Glides. 92 dB Efficiency and a 20 year OEM Warranty! 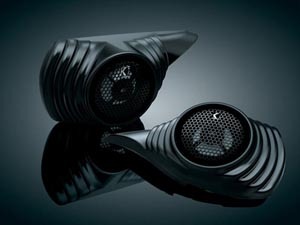 Comes complete with 100% plug n play wire harness, Second set of cloth covered speaker grills, Optional chrome indicator bezel. Pod matches stock "Satin black" inner fairing color but can be easily painted. 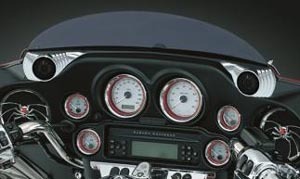 Just remove your stock gauge bezel, remove your stock gauges install your gauges into your new HT-0200, run the wires into your fairing and connect to your speakers, snap bezel back into place, install two screws and your are now done!